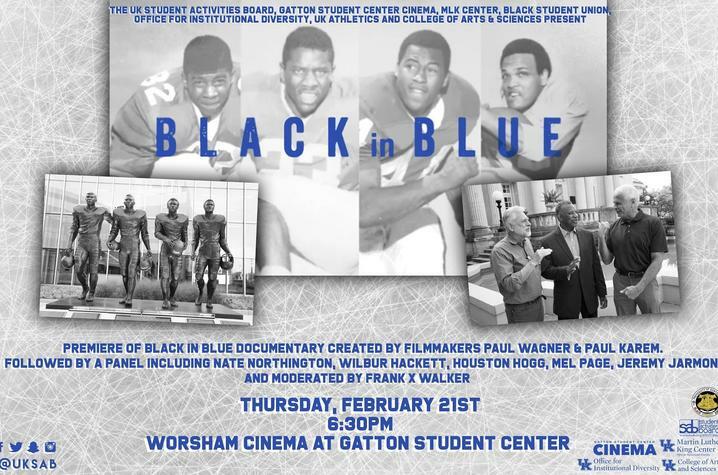 "Black in Blue" explores the groundbreaking history that took place on UK’s football field in 1967 when Nate Northington and Greg Page became the first African-American scholarship athletes to play in the Southeastern Conference. Their courage to play paved the way for two more African-American players, Wilbur Hackett and Houston Hogg, to join UK’s football team and started a revolution of change within the South. Producers Paul Wagner and Paul Karem created the film to tell a positive story of triumph in a time of a deep divide and regression in society. The film uncovers many incredible untold stories. Everything from the governor of Kentucky taking the lead in recruiting Nate Northington to a friend and teammate of Jackie Robinson discovering Greg Page and realizing that he could be the "Jackie Robinson of the SEC," and so much more. “Black in Blue" celebrates the role of the university and four UK athletes in one of the most important breakthroughs in sports and civil rights history, the integration of the Southeastern Conference,” said film producer and UK alumnus Paul Wagner. Following the film, UK English Professor Frank X Walker will moderate a panel discussion with the co-producers Wagner and Karem, as well as Houston Hogg, Wilbur Hackett, Nate Northington, Mel Page and Jeremy Jarmon. To learn more about the film or watch the trailer, please visit BlackinBlue.org.